Day 12 of the IDC: Looking for a dream job? Try being a dive instructor! 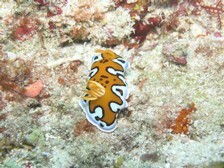 We arrive at Sinai Divers early in the morning. Most of the candidates are already on the roof. All of them wear their IDC shirts and wave at us seeming to be in a good mood. After everyone has checked to make sure their documents are complete the candidates head towards the congress hall of the Hilton Hotel where the exams will take place. The two PADI examiners came a long way from Thailand and South Africa. They are already waiting for the participants in the congress hall. Here our candidates meet five more students from other dive schools. We are impressed with Lucy. She is here to wish her colleagues luck. She is arriving with high spirits and helps to ease the nervous atmosphere. After a brief introduction the two examiners hold a presentation about today’s procedures. Then candidates get their exam papers. Everyone but the candidates and examiners have to leave the room. We wait anxiously outside for the results and hope for the best. Nancy told us that this part is the hardest for the two candidates from Egypt. Unfortunately the test is only available in standard Arabic language, which differs significantly from the Egyptian language. Many questions are tricky. We are told that you often have to look twice to understand some of them. Other candidates are especially afraid of the physics exam. After nearly three hours of theoretical exams the door finally opens and Leeann is coming towards us. “I think I’ve done it,” she says. Leeann seems too stunned to enjoy her success. A little bit later the other candidates also finish. We clearly notice joy and relief in their faces. The two participants from Egypt are especially happy. They hug Yasser over and over again because of his patient assistance during the IDC. Only Ramy needs to repeat the equipment exam again. However he already passed the infamous physics exam. But today is far from being over. Next on the schedule is the open water examination. 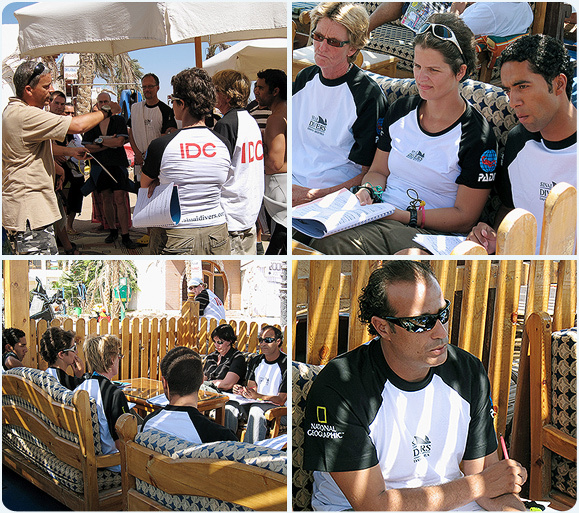 The candidates assemble their equipment and drive to the Lighthouse in Dahab. Nancy tells the participants once more what they have to do and mentions the most common mistakes. The examination will be conducted in a familiar way: First everybody holds a briefing on land; next the candidates must demonstrate what they have learned; then after leaving the water this section ends with a debriefing. The examiners also explain once more what the participants have to do. They put in little jokes to lighten the anxious atmosphere. Under water the candidates will encounter the well-known role playing game. But it will be more difficult this time as our candidates have to deal with the participants from the other courses as well. This section leaves a very bitter aftertaste for Giovanna. Her assigned student is from another IDC course. He makes a mistake that the examiners did not assign. Unfortunately Giovanna does not see it and breaks a PADI standard. It seems unfair but she ends up with a one and fails the open water exam. This failure was quite a shock and nobody seems to believe what just happened. Giovanna is very unhappy and angry at the same time. She is close to giving up completely after the day started so well for her. Nancy and her team have a hard job convincing Giovanna to continue and complete the rest of the program. If she passes all the other parts all she has to repeat is the open water assessment in another IE. All the other candidates pass the open water part successfully. Now we head back to Sinai Divers and the candidates have to hold presentations. We do not see any problems here. This part has been practised extensively in the IDC and all the candidates pass easily. Tomorrow will be the exam in confined water. In addition Ramy has to repeat and pass the equipment exam. Afterwards the newly qualified instructors will get an official certificate and in the evening there is a big party where we will definitely attend as well. Day 1: How to become a dive instructor? 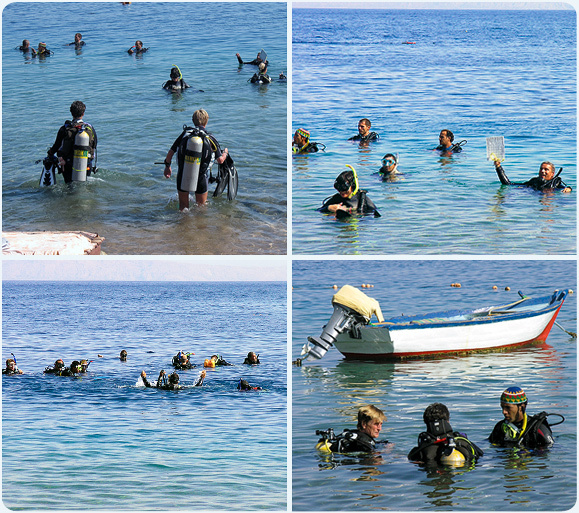 Day 2: How to become a dive instructor? 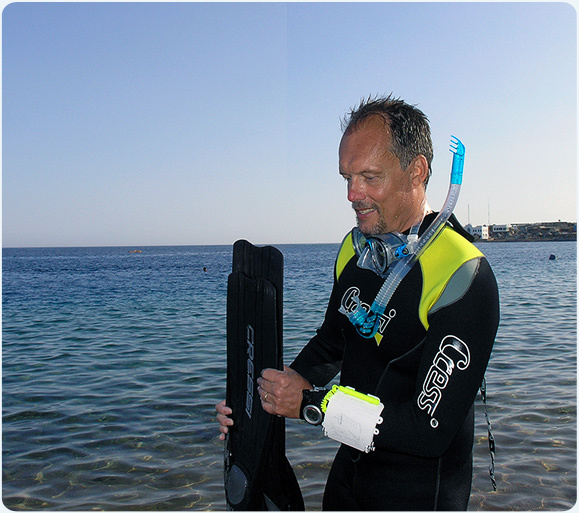 Day 3: How to become a dive instructor? Day 4: How to become a dive instructor? Day 5: How to become a dive instructor? Day 6: How to become a dive instructor? Day 7: How to become a dive instructor? Day 8: How to become a dive instructor? Day 9: How to become a dive instructor? Day 10: How to become a dive instructor? Day 11: How to become a dive instructor? Day 12: How to become a dive instructor? Day 13: How to become a dive instructor? Looking for a dream job? Try being a dive instructor! But how do you actually become one? Day 9 of the IDC: Looking for a dream job? Try being a dive instructor!